Matagorda, Texas has approximately 58 miles of beach. 23 miles of the beach east of the Colorado River is open to vehicles. The remaining 35 miles of beach is west of the Colorado River and only accessible by boat, kayak, canoe or other watercraft. For those willing to walk a few miles or more West Beach has the best beachcombing since it is isolated from the heavier traffic on the other side of the river. 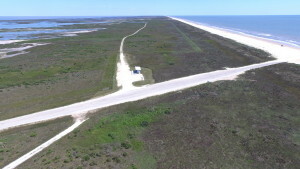 The beach is public property in Texas, but all the land behind the vegetation line is private on the west side. Do not venture off the beach or you could be arrested for trespassing or more likely you could run into dangerous wildlife. You can rent a kayak if you want to get to West Beach and paddle across the river or out and around the west jetty on a calm day. On the East side there are trash cans on the beach for the first 3 miles. The first 8 miles of beach beyond the dunes is private property. After 8 miles, it is state property behind the dunes and there are lots of trails you can explore. Watch out for rattlesnakes if you are walking in the dunes and grasses. Driving in the dunes and damaging the native grasses is illegal so stay on the established trails or the beach. Check out the Emergency Info page before you go. 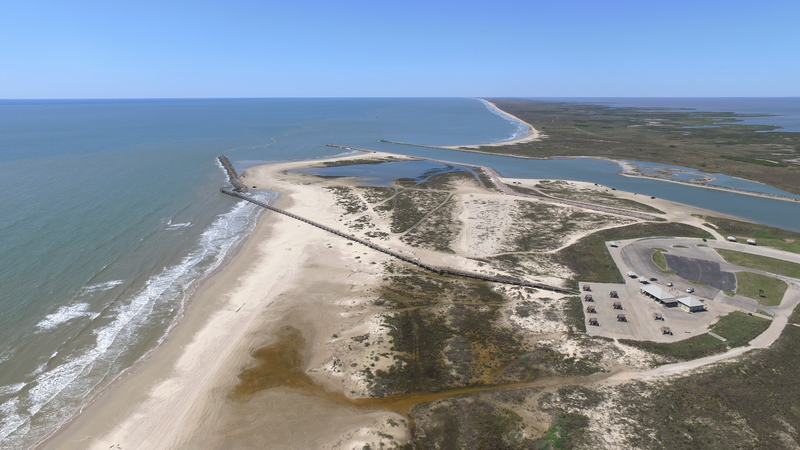 There are two entrances to Matagorda beach. To get to the main beach entrance from Matagorda, go south on FM2031 for approximately 7 miles. Turn left onto the public beach access road (there is a sign). Drive until the road ends at the beach. You can drive onto the beach or park at the bathrooms. To get to Jetty Park, continue straight on FM2031 past the beach access road. 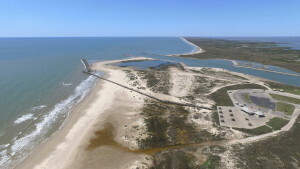 FM2031 dead ends into Jetty Park next to the Matagorda Nature Park. There is a beach entrance on the west side of the parking lot. To access the beach east of Jetty Park you can drive under the Pier when the tide is low enough. Watch your clearance when you go through. Camping on the beach is welcomed in Matagorda and there are no additional fees to camp. You can camp anywhere on the beaches in Matagorda county including Jetty park and west beach for up to 72 hours. Tents and RVs are permitted but beware of the soft sand if you are bringing an RV. See below for information on parking areas if you do not or can not drive onto the sand. Matagorda beach is a great place to go swimming, but you should check the conditions when you get there. Swimming near the jetties, piers and passes is dangerous due to the currents in that area. Mitchell’s Cut and the mouth of the Colorado River often have very swift currents. Most drownings on the beach occur in these areas and are preventable. When the waves are large on the beach, the riptides will get stronger. Stay in shallow water when riptide warnings are in effect and swim sideways to escape a rip current if you get caught in one. It is always best to have someone on the beach to call for help if you do get in trouble. If you have any doubts or questions about the conditions, ask a local. The people in Matagorda are very friendly and will happily give you advice. If you don’t want to drive onto the beach there are a couple of parking areas within walking distance. The first and best area is Jetty Park at the end of FM 2031. This is a County Park and there is no usage fee. There are bathrooms, outdoor showers, and covered picnic tables as well as a walking pier and the Colorado River Jetties. Beware of rip currents near the jetties and pier. Swimming is prohibited in these places. The second location is next to the bathrooms off Dunes Drive at the main beach entrance. Make sure not to park on the road or you may be towed or ticketed. You can find information on Hotels, Motels, RV Parks, Vacation Rentals, Restaurants & Shopping at the Matagorda Chamber of Commerce website.